A few years back, I entered a contest to win a rare Japanese import Transformer. Known as Star Convoy in Japan, he was unknown here in the States, as he appeared in a Japan-only TV show. I knew I had to have it, and so I wrote this fun little piece as my entry for the contest. The 1984 JC Penney’s catalog. A big, brown UPS truck. Back in ’84, I was a wee lad of 10 years old, and totally addicted to Transformers. I watched the cartoon every day, and I’d talk about it with friends on the way to school. I had the cool red Transformers lunchbox (what I’d give to have one now). My little brother had decided to collect the “bad guys”, which was great because I loved those Autobots. I had a red Bumblebee, Prowl, Sunstreaker, and a couple more. But there was one special Transformer I wished for: the intelligent, courageous, American-as-apple-pie-and-baseball leader of the Autobots, Optimus Prime himself! When the JC Penney Christmas catalog arrived, I frantically tore through the pages, and there he was, in all his primary-colored, tractor trailer glory. My brother asked for Megatron, of course, and I dreamed of the battles we’d have. Of course, Optimus would always beat the snot out of Megatron; it was no contest! I listened secretly as my Mom ordered the toys over the phone (to be shipped via UPS, this will be important later) and cackled in maniacal glee! The greatest Autobot would soon be mine! Another Prowl!? ( If this story were a movie, at this point the camera would zoom in on my poor, waifish, preteen face, and the music would be swelling with feeling.) I looked up, open-mouthed, in shock. Across the tinsel and wrapping paper carnage, my brother was ripping into his Megatron, whooping in delight. My dad explained that Penney’s had called and that Optimus was sold out, but if they got more stock in, they’d deliver one. He knew I had busted the windshield off of my Prowl (who hasn’t?) and that he was a favorite of mine, so he bought me one to replace it. It was a wonderful gesture on my parents’ part, as Prowl was a cherished toy too, but police cars just aren’t giant red tractor trailers. I know there were other Transformers I opened that day, but I cannot remember them clearly. I look back fondly on that Christmas, and yet I would be haunted by the disappointment of it for a long time to come. For months, maybe even years, whenever I’d see a UPS truck I’d stop and yell “Hey maybe my Optimus Prime is in there!” I came home from school one day that spring, and beheld a UPS truck pulling out of my driveway. (Again, if this story were a movie, at this point, the music would crescendo in emotion, and in slow motion I would be running across the neighborhood, fists pumping the air, hollering, with tears of joy and fulfillment glistening down my cheeks.) I burst through the door, asking my mom for my Optimus Prime. Alas, my hopes were cut down faster than a tree in the Brazilian rain forest. The UPS truck was delivering merely clothing, and not the robotic guardian of freedom for all sentient beings. Again, I was devestated. The years passed. 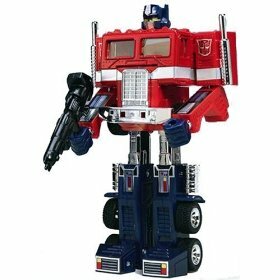 I enjoyed and carefully kept up with my Transformers, but I never did get an Optimus Prime. I moved on to other things, like band, girls, college, and so on. The “Optimus Prime incident” became something of a joke among the family. In an odd coincidence, the first wreck I ever had occured when I rear-ended a car… after passing a UPS truck. I’m fairly certain Megatron was the driver. I only use the Postal Service to this day. By 2001, I was married, and had a young son and a newborn on the way. I had heard from a friend about the new Transformers line, Robots in Disguise. When I saw that though Optimus Prime was now a fire truck, he looked very similar to the old Optimus I never had, I became determined to purchase him for my son. Of course, I did this when he was away visiting relatives for a month, and I went ahead and opened it for him, but, yeah, pretty much it was his. Playing with Transformers with my own children was an indescribable experience. Soon after this, Toys’R’Us reissued the original Optimus Prime! I told my parents, and informed them that they could correct one of the greatest injustices of modern history if they’d purchase this new Optimus for me. Then I could be done with this obsession, and forever become a well adjusted, productive member of society. They jumped at the chance, and finally, after almost twenty years, I opened up Optimus Prime. I put on the stickers. I transformed him. Again and again. (Here, the end credits would be rolling and a remake of some classic tune by a cool new band would be playing.) Everyone lived happily ever after. For Christmas in 2003, we visited my wife’s family in Michigan. My mother-in-law does it up right, and we always have a good time. Well, it just happens that she has a Sam’s Club membership, and saw this toy there, and remembered the Optimus Prime story I had told her, and lo and behold, I open up a yellow fire truck Optimus Prime! This got the wheels to turning in my head, as now I had a fairly decent collection of Optimus Primes going on. The next Christmas, I asked my mother-in-law for an Energon Optimus Prime since they were on sale for half off. And again, on Christmas day, I opened an Optimus Prime. By now my family had all realized that the Optimus Prime incident had left far deeper scars within my psyche than was previously suspected. Over the past year, the Optimus Prime collection has grown. As in, it has gone from about six to two dozen of them today. I’ve been able to get great deals on some cool figures like RiD Scourge and Universe Ultra Magnus. I even bought a 20th Anniversary Optimus Prime on sale one day when everyone in the house was home sick with the flu. I told my wife he just happened to be right between the cough syrup and the chicken soup, which oddly rang up for twenty bucks each. Now what does all this have to do with Star Convoy, you ask? Well, as Christmas approaches this year, I’m looking for a cool Optimus prime related item to ask for. 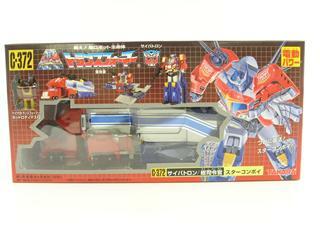 I see that the holy grail of all Optimus Primes, so rare and hard to find he’s not even CALLED Optimus Prime, the ultimate Generation 1 leader, Star Convoy, is being reissued. Now, the problem is, I’m just a poor 5th grade teacher, and on that salary I can’t justify purchasing an $85 toy. Sadly, though my mother-in-law and my own mom love me and all my strange little quirks, I know asking for a toy over $40 is not gonna fly. (I determined this after seemingly innocent conversations with each of them that I am sure they had no suspicions about.) So, in order that I might relive that tragic, destiny altering day twenty-one years ago, and open another Optimus Prime, I implore you, the judges of this contest, to grant a wish to me, my two sons, and my entire extended family, and choose me to recieve Star Convoy, the ultimate, timeless piece of Transformers history. I promise that Star Convoy will be opened only on Christmas Day. He will be played with and proudly displayed. He will probably get loose joints, be the playground for an army of mini-cons, get smeared with juice and who knows what else, but above all, he will be loved and enjoyed like all of our toys are. I thank you for reading and for your consideration in this contest! I’m pleased to report that I won the contest! As promised, we opened it open Christmas Day and have enjoyed it ever since. Star Convoy is the most valuable toy I own, with the possible exception of the toys I still have leftover from my childhood. Not so much because of it’s monetary value, but for the great memory I had opening it with my kids. Next Welcome to The Learning DM!